Does the world need any more DIY coasters? Yes, it does! Simply because it’s a great project to take on even if you’re a beginner. We love DIY coasters because you can use your creativity and make just about anything within this frame. It’s a great way to hone your skills in various techniques. Be it wood crafting, sewing, weaving, or paper crafts. And you always need a few more coasters in your home! 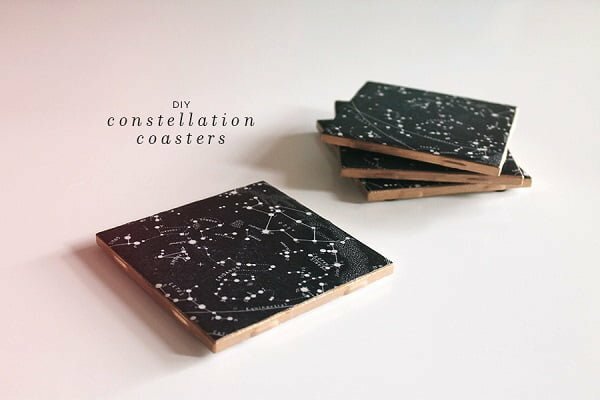 So check out these 45 amazing tutorials that will show you how to make just about any kind of a coaster. Better yet, you can combine many of the following techniques to create your own unique crafts. Have fun! Here’s an easy wonderful project that doesn’t require much skill. All you need is some creativity and acrylic paint. 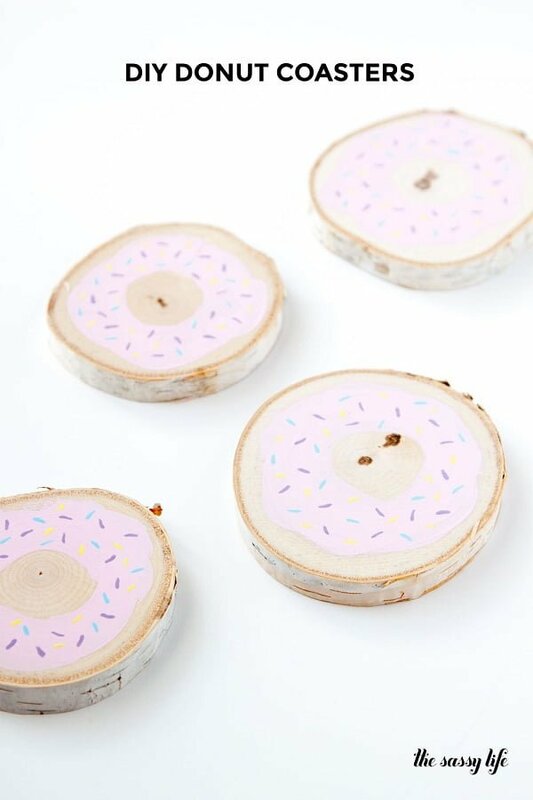 Grab a few birch coasters and paint them to make these cute donut coasters that will make your dinners that much more fun. The whole list of supplies consists of the coasters, acrylic paint, and some brushes, so it is a very quick project. You can complete it in under an hour and have your coasters ready. Want to make something artistic? This tutorial shows you how to make pattern art on cork coasters. There are no rules set in stone – you can use your creativity and imagination to make patterns in your liking. You make such coasters for yourself and as gifts. The coasters will make a great present for anyone if you know their favorite style. The list of materials is short enough to get you started quickly. Basically, you’re just working with acrylic paint and brushes in this project as well. If you’re looking for how to spend your night crafting, this is a perfect idea. 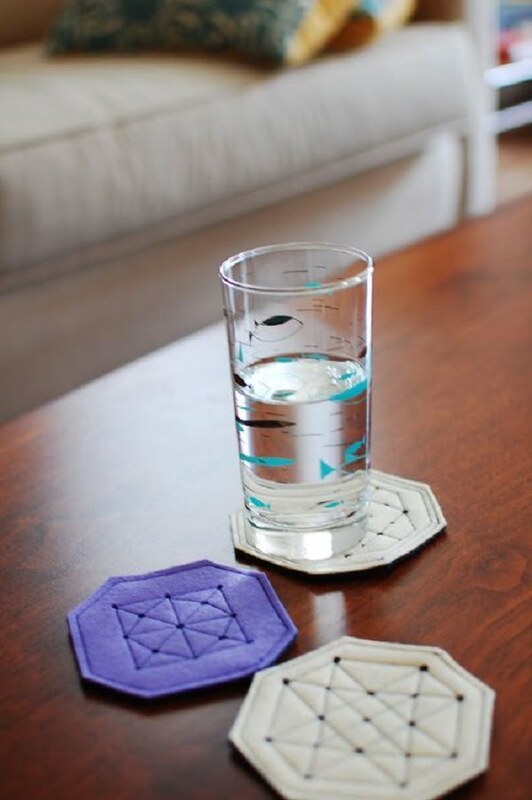 These are the quite unique geometric DIY coaster that you’ll really enjoy making. They are really easy to make but look stunning. So after making just one of them, you won’t be able to stop making more, we promise you. And having made several of them you can put together the coasters to create a serving trivet. As with most projects for DIY coasters, this one doesn’t need any special supplies either. You can make them from simple cork tiles by using just acrylic paint and washi tape. Want to make something from other than cork or wood? These truly unique DIY coasters are made from felt. It’s a little bit more complicated project but it doesn’t require machine sewing either. All you’ll have to do is cut and stitch. The technique is simple so you will not have trouble completing the project. For materials, you’ll just need colored wool felt which you’ll cut into simple shapes and stitch together. It’s such a beautiful craft project that you’ll enjoy making on any night. Who says Perler beads are just for kids. You can make beautiful coasters from them too. The end result is colorful and playful. It will do so well when serving meals to your kids as well. While initially this project idea was intended for a wedding, it is just too good to keep it just for that special occasion. 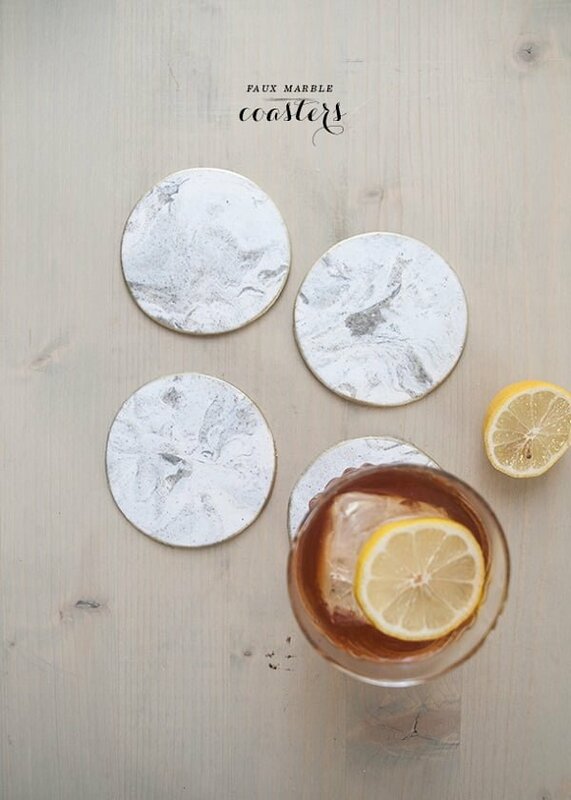 You can make these coasters on any night of the day. You can make it fun and involve your kids in the craft as well! 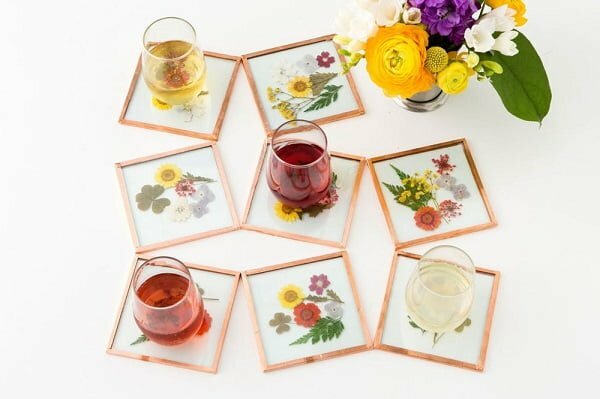 Pressed flower coasters are so gorgeous. The project was created as a spin on a bouquet of flowers for Mothers Day but it’s so adorable that you can make it any time of the year. And not only as a gift but as a statement decor piece as well. It’s very different from other DIY coaster projects on the list as far as the materials go. You’ll need things like glass tiles and dried flowers (of course!). But it’s not a complicated process. There’s also a kit you can buy to make it easier too. You’ve probably been thinking this as well. Why not print your DIY coaster designs? It’s a very valid idea and indeed, why not? 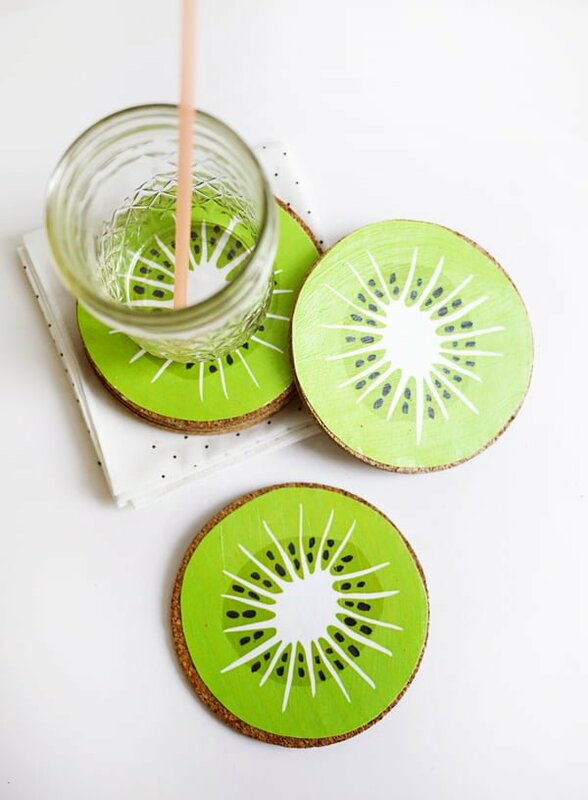 Here’s one idea for printable kiwi coasters. It’s a very refreshing design good for serving summer cocktails and more than that! The printed designs are best used with cork coasters. You’ll need a decent printer that would be able to print colored images on card paper as well. Everything else (including printable designs) can be found in this tutorial. One of the ideas of DIY is making something you can’t find to buy anywhere. And this is that kind of a project. You’ll be able to make your own faux marble DIY coaster from clay by following the instruction in this tutorial. It’s pretty simple too. You’ll need white and black clay that you’ll knead together and cut in hexagon shapes. Then just bake it, literally! Such a fun one night project to make at home! Did you know you can make DIY coasters from a rope? In this case, it’s clothesline, to be exact. All you have to do is roll it into a flat circle and sew it or glue it together. The next step is to paint it the way you like. This tutorial shows you a technique on how to sew the clothesline to make a coaster. You do need a sewing machine to do it but you can modify the project if you don’t have one. It’s a lovely project to take on in any case! For a nice rustic touch, make these DIY coasters from twigs. It’s a lovely idea for anything farmhouse style or for fall occasions. The idea is simple and easy to complete. The end result is truly adorable. You’ll be making these coasters all night long? The instructions in this tutorials aren’t in English but you can use Google translate to read them. There are very clear pictures as well, so you’ll be able to follow it without any problem at all. Do you like crafting with clay? Even if you haven’t tried it before, this DIY coaster tutorial is so much fun to start doing it. The process is simple and the end result will brighten up any coffee table. 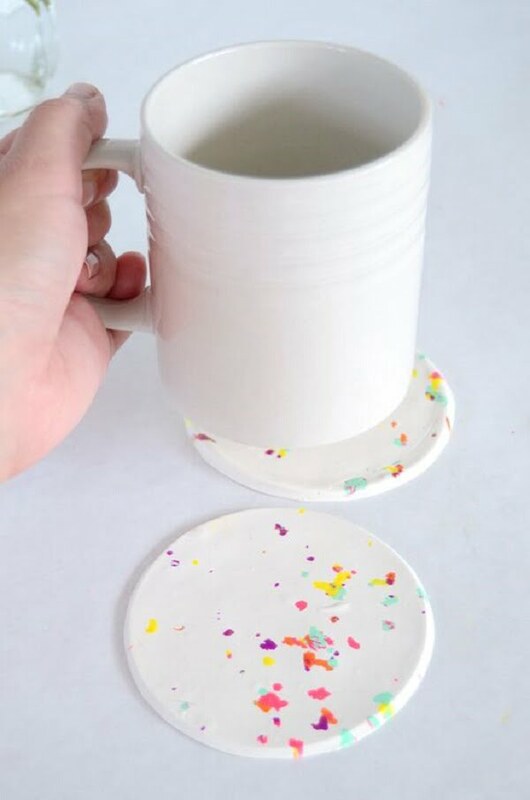 You can easily make these confetti coasters as gifts as well. It’s a unique gift that you’d have made yourself! All you need for this project is clay and a cheese grater! Check out the instructions on how to turn it into adorable confetti DIY coasters. Another easy tutorial on how to make your own DIY coasters from clay and paint them in a pretty pattern. You’ll love how easy it is and how you can use your creativity to create something unique. It won’t take much time at all before you can rest your cup of tea on a cute coaster. They will brighten up your coffee table at all. And did we mention you can give away your painted coasters as gifts? It’s so much fun! If you’re not much of an artist you might not be able to hand paint your DIY coasters. In that case, you need some ready-made art that you can use to decorate them. What about the wallpaper? There’s an endless variety of choices to make the perfect coaster. This tutorial shows you how to use wallpaper and stone tiles to make stunning coasters. The project can get a bit involved so you’re better off doing the coasters in batches. 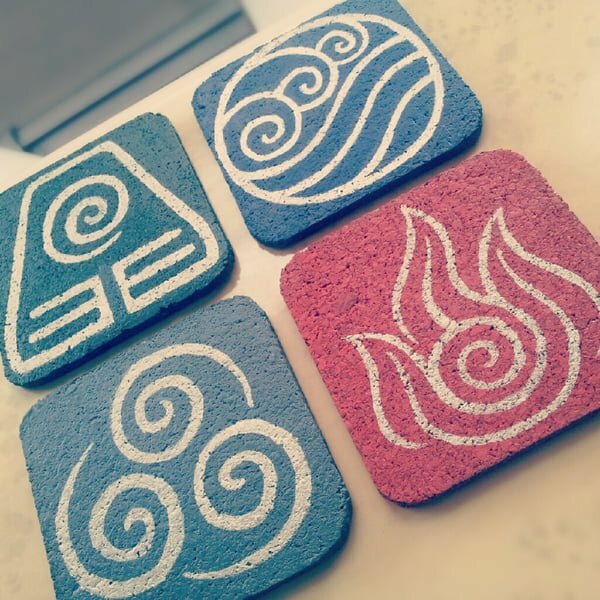 At the end of the day, you’ll have a great choice of your own handmade DIY coasters! 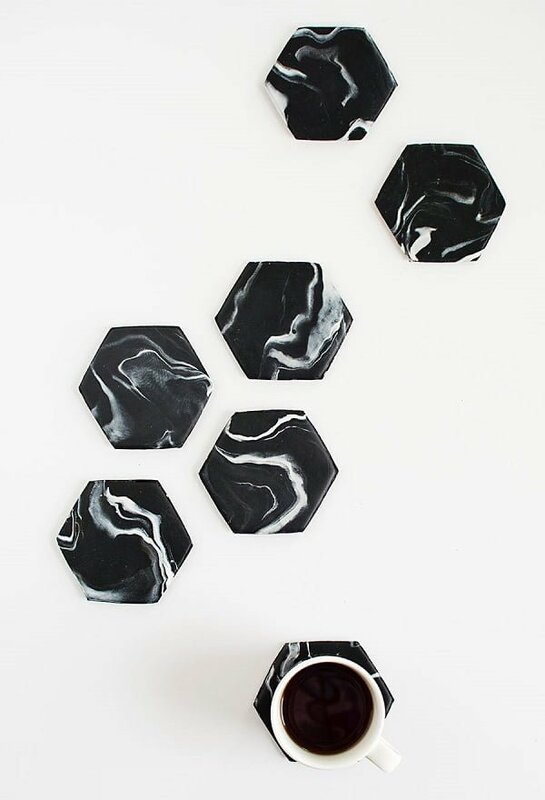 Here’s another way to make beautiful DIY coasters from ceramic tiles. This technique uses printout images to decorate them. So all you need to do is find the right images and print them out. 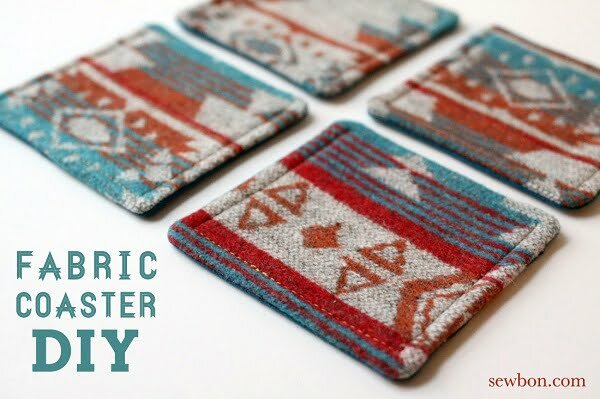 The rest of the tutorial will show you how to turn them into handmade coasters in no time. Want to make your coasters look like they’re store-bought? Add golded edges to them! This way you’ll not only prettify your coffee table but you’ll be able to make coasters as gifts too. Have fun! Maps make great statement decor and you can either love them or hate them. If you fall in the former category you’ll love map coasters too. They just burst in so much color! And they are easy to make from just about any kind of tile (cork, wood, stone, ceramic). This tutorial will show you exactly how to do it and you’ll have so much fun doing them. Be sure to make enough! Aren’t afraid of sewing? 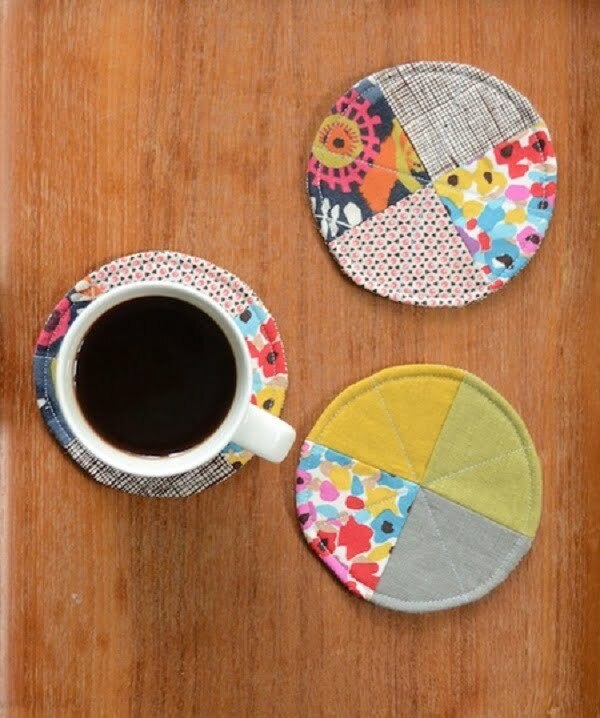 You’re in luck because you can sew together awesome DIY coasters from felt. Citrus theme is perfect for refreshing drinks and you can make a beautiful set of coasters for this. Not only you’ll brighten up your patio serving cold drinks during summer, they will work in your home decor any time of the year. 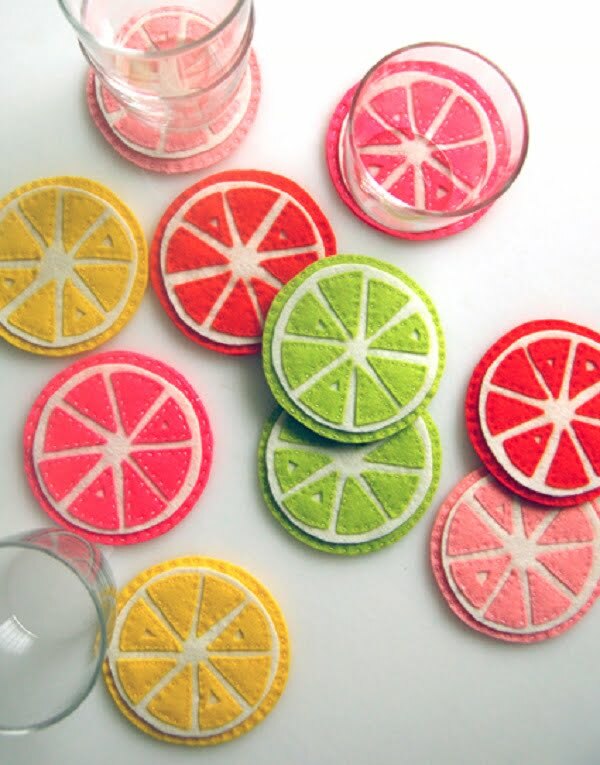 Follow this tutorial on how to exactly make citrus coasters and most importantly, have fun! For this project, you’ll need a thick branch of a tree. So look out for when you have to do some garden maintenance or have a fell tree in your backyard. The idea is simple. 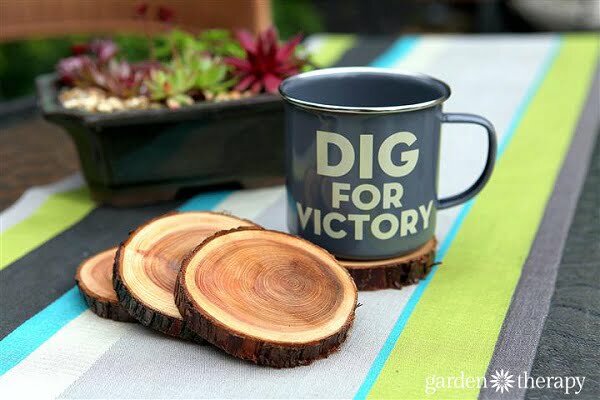 Cut tree branch into thick slices and make DIY coasters out of them. The tutorial shows how to do it exactly. You will need sandpaper and varnish, and the skills to operate a chainsaw. This makes the project a bit manly. But we’re sure you’ll have a lot of fun anyway (especially if you’re a guy). Can you believe how creative these DIY coaster tutorials can get? This one shows you how to make coasters from curling ribbon! Check out how it’s possible in this tutorial. You’ll need curling ribbon, cork, glue, and a lot of patience to wind the ribbon together. It’s all worth it, though, because there’s no limit in the color patterns you can get. Once you get a hang of it, you’ll have a lot of fun making these coasters. Need more ideas for a handmade gift? Turn photos into coasters. It’s a great unique gift and it’s even better when you make it yourself. Imagine the surprise of the recipient! 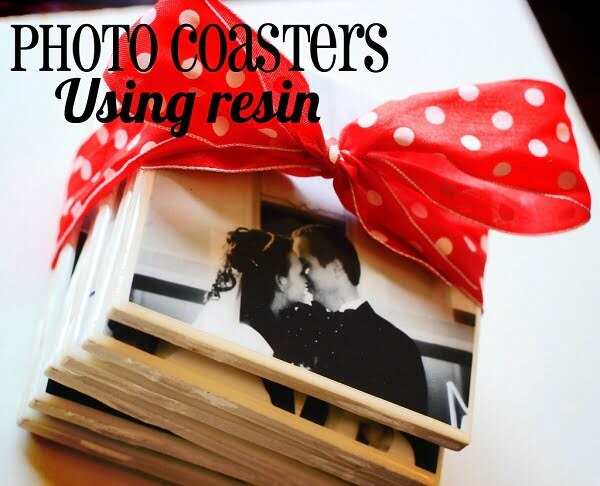 This project uses resin to make the coasters from photos. So you’ll need resin tiles and high-quality photos to glue on them. The exact technique is shown in this tutorial. Make sure you read all the tips and trick in order to make the perfect coasters. This project is certainly not for everyone. It’s for those of you who actually know how to crochet. If you know the craft you’ll definitely enjoy making these DIY coasters. You’ll find the pattern in the tutorial. The good thing about it is that you’ll just need yarn and tools to complete it. Needless to say, it will make a great gift too. 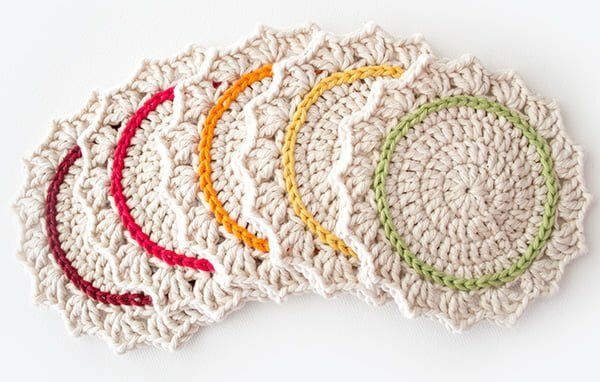 And as a crocheter, you’ll have a lot of fun making these coasters. Check it out! This craft project is for men out there. 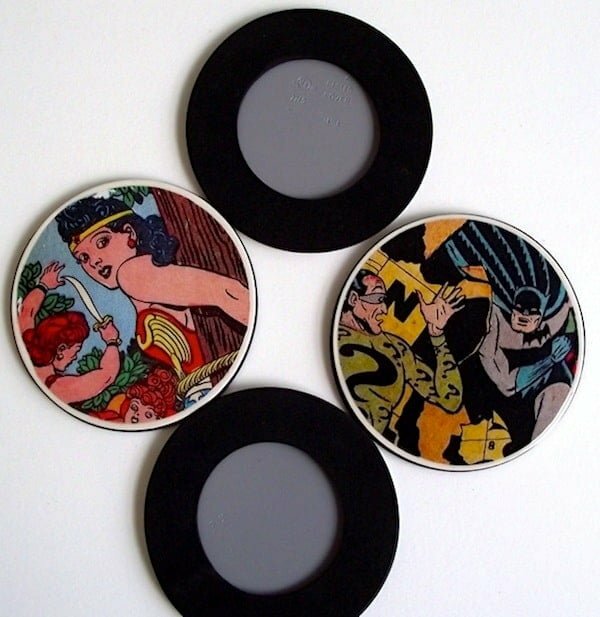 It’s hard to think of what DIY coasters for men would be but comic book theme is right on the spot. To make it even more manly, you’ll use metallic electrical outlet covers as the base. So you’ll need old comic books or printouts, mod podge, and outlet covers to begin with. The rest of the instructions are included in the tutorial. It’s a great way to involve the man in your life in crafts or make a manly gift for them! Talk about a unique craft project! We’re all for recycling and upcycling in our crafts. And this project hits the nail on the head. No doubt, you have a lot of old magazines lying around. So here’s a good way to put them to good use. 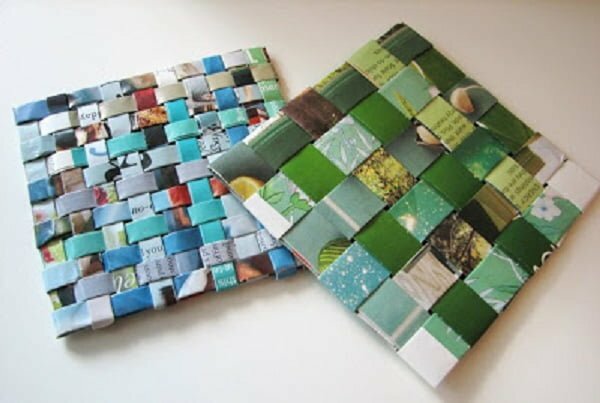 You’ll learn a technique of weaving magazine cover paper into beautiful coasters! The tutorial will show you all the tricks you need to know. It’s a wonderful project that you can take on while watching TV and relaxing. Have fun! You might have seen this idea somewhere and now is the time to make use of it. 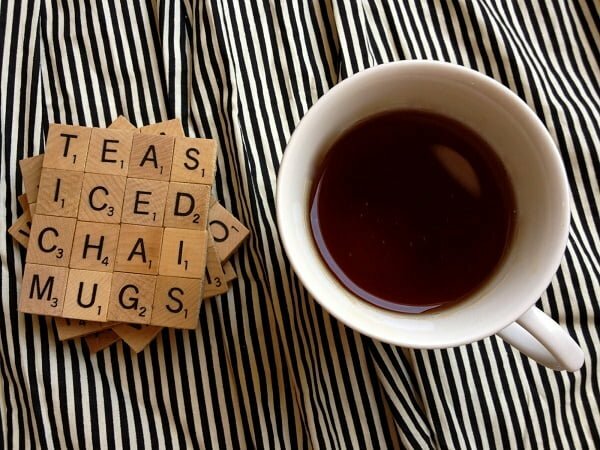 Using scrabble tiles in such a creative way is a brilliant project for DIY coasters. It’s playful and quite unique. Can you see scrabble coasters as statement decor for your coffee table? The tutorial will show you all the details needed to make these coasters. In a nutshell, you really need just a lot of scrabble tiles, cork, glue, and some patience. If you like sewing you’ll love this project too. Making these easy fabric DIY coasters is a great way to practice as well. 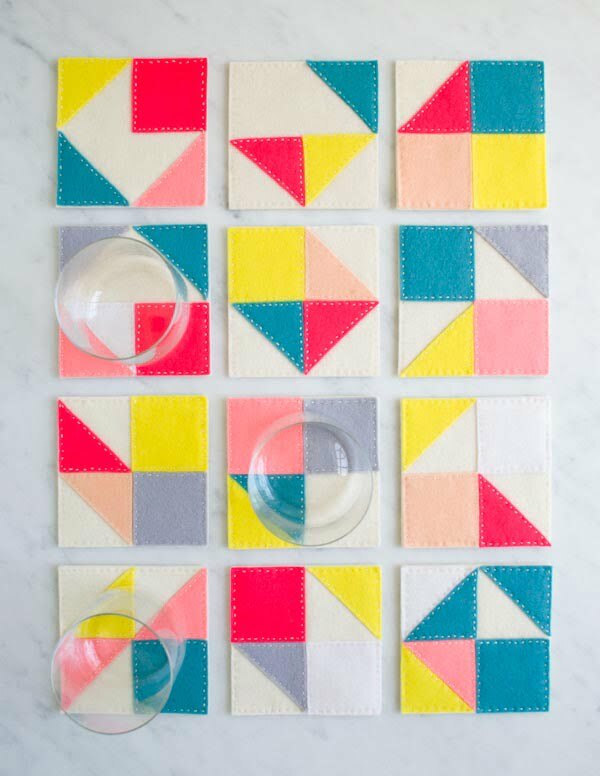 There’s nothing easier than trying out your hand at sewing simple squares for coasters. You can be creative with mixing and matching patterns as well. All in all, it’s a fun night’s project that you can enjoy during your spare time. You won’t probably give them as gifts, but they will definitely work as handy coasters in your kitchen. 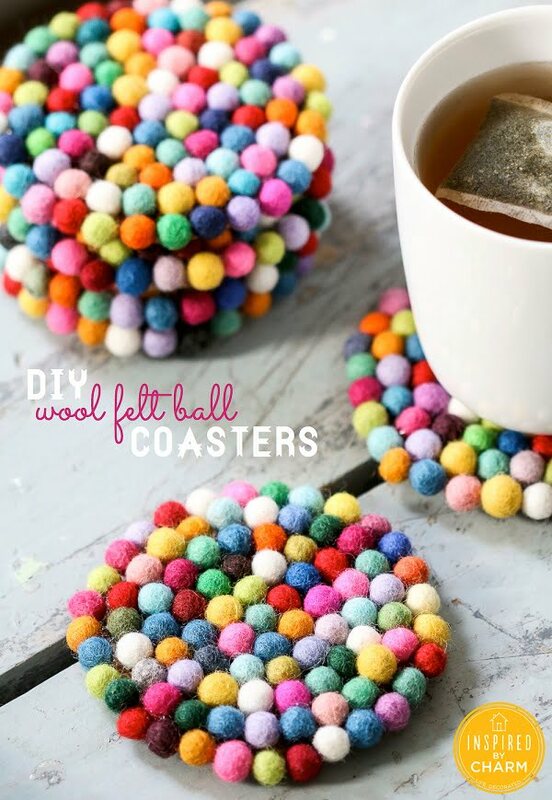 Add some dimension to your coasters by making them from wool felt balls. They are so cute and fuzzy, and it’s so much fun to make them. It’s easy too! You’ll need a lot of wool felt balls for this project (about 100 per coaster) because they are so tiny. Use cork as the base. You’ll need some patience with gluing them all together one by one but it’s very rewarding! 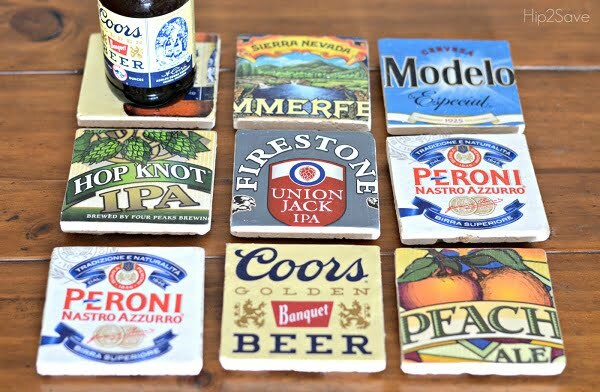 Want an easy project for your DIY coasters? 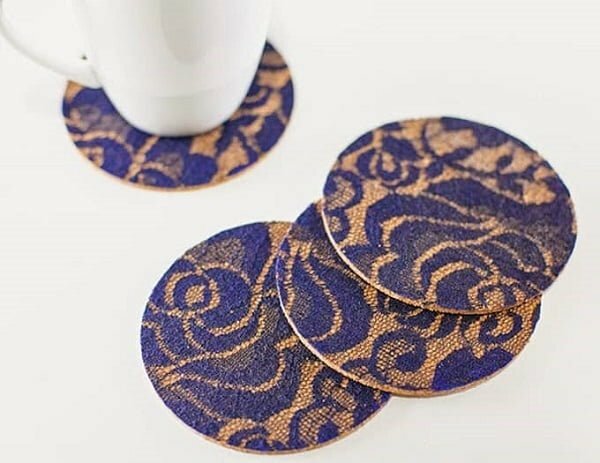 You can make it really quick with just cork coasters and contact paper. Just choose the pattern of your liking and paste it on the coasters. It doesn’t get any easier than that. At the same time, it’s a fun project to do. You won’t stop making these DIY coasters! You might not have a screw punch at your disposal but it’s a great opportunity to get one. It’s an amazing tool for many uses. This particular DIY coaster project uses the screw punch to make creative coasters from felt. Punch some holes and sew pieces of felt together with thread. It makes adorable unique DIY coasters. We’re sure you’ll have a lot of fun with this project! Whether you’re a fan of Avatar or not, this theme makes really cool looking coasters. Although the process is a little bit involved, you’ll have fun doing it. Luckily the process is very well explained in the tutorial. You’ll need cork tiles and image printouts along with paint, mod podge, and tools. Yes, it will involve brush painting but you’ll use printouts as stencils to make it really easy. 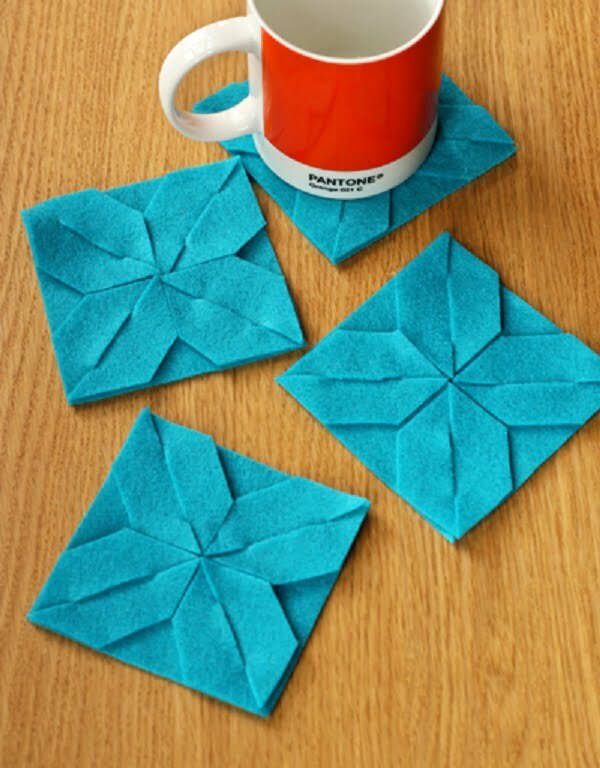 Making inter-lapping shapes from felt is actually a great way to make DIY coasters. They look cool and complicated but they’re actually easy to make. This tutorial shows exactly how you can do it. You’ll need felt pieces and scissors to complete this project. All you’ll have to do is download and print out the cutting template. Enjoy this little project on your crafting day! 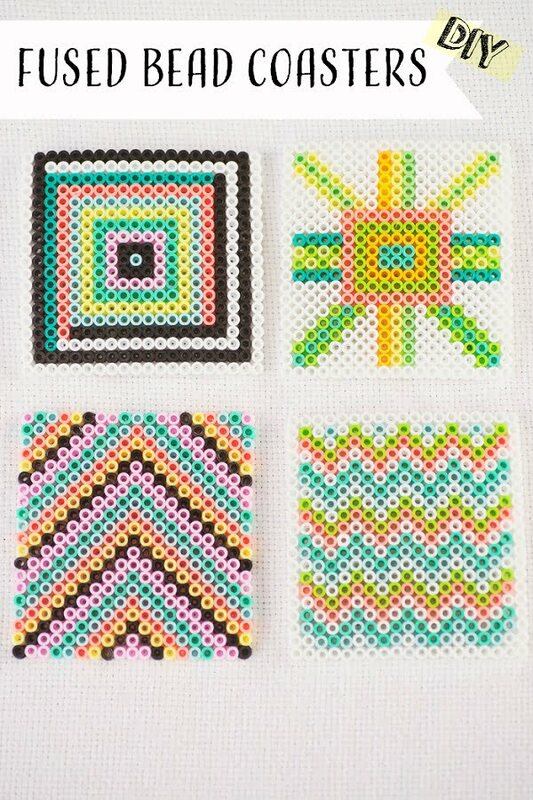 Woven coasters may seem like an involved project but it’s actually great for beginners. It’s rather easy to complete when following the instructions. 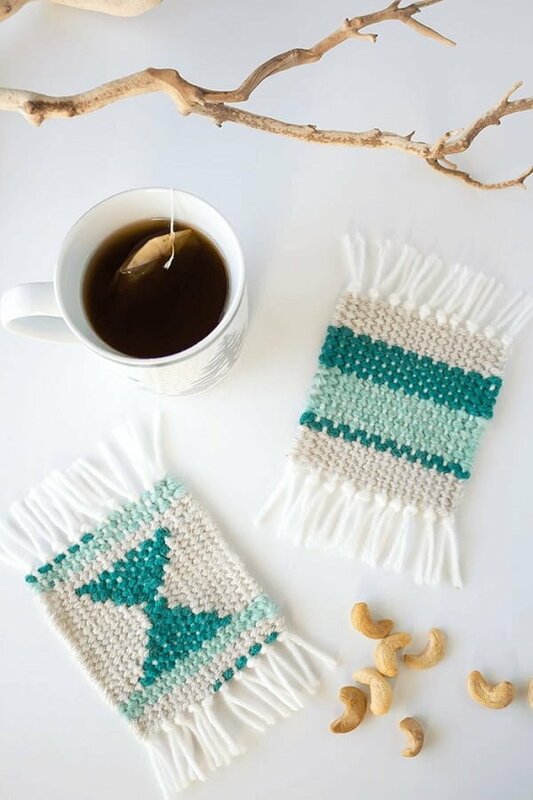 And the possibilities of weaving your own little coasters are endless. Just think about the patterns and colors you can get by weaving. 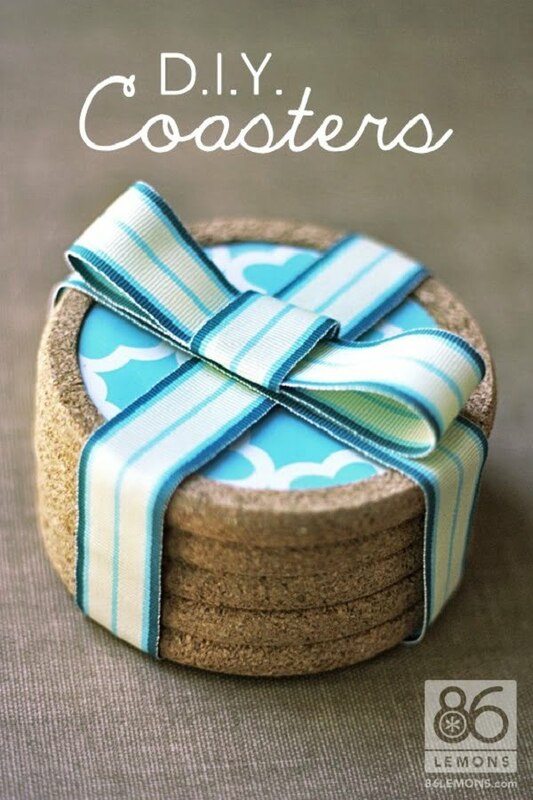 These DIY coasters are fun to make for yourself and as a gift to someone. 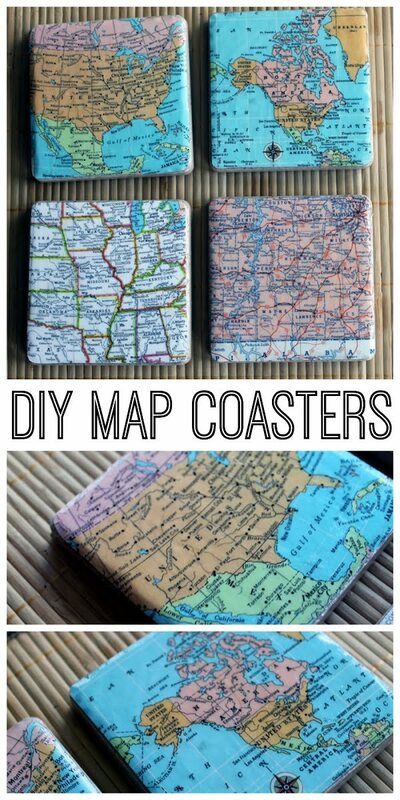 These have to be some of the coolest DIY coasters on this entire list. 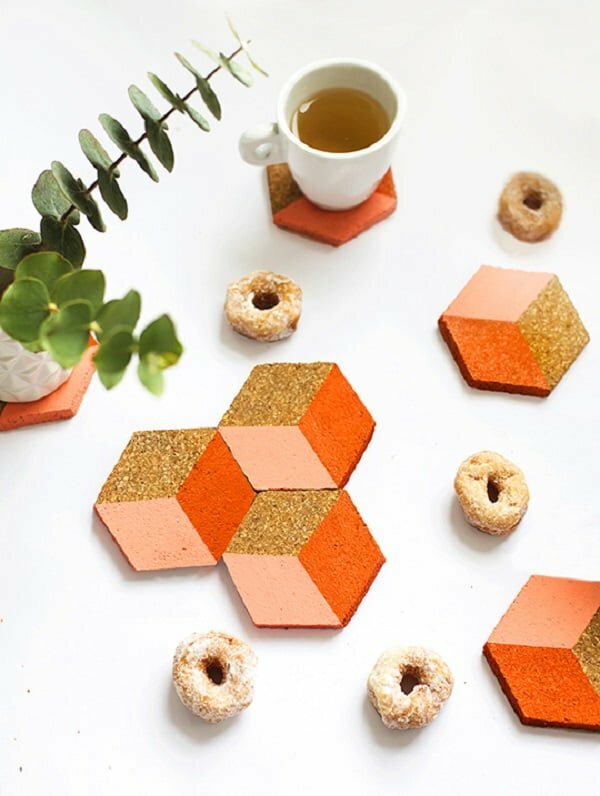 You’ll be making concrete coasters with cardboard inserts. Made this way, the coasters aren’t heavy because you’re using concrete just to cover the cardboard. But they look really unique. Want a unique conversation piece for your table decor? This is it. And you can make them as gifts as well. Check out this great tutorial. There aren’t enough projects with resin. You can actually make great things with it because it’s very flexible. 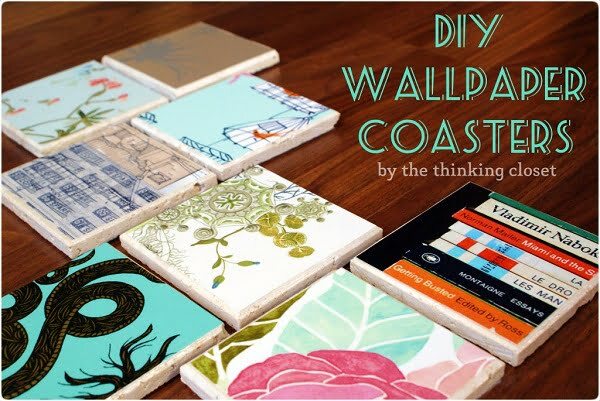 In this case, you’ll be making a coaster with seashells. And there’s probably no other way to make coasters out of them than this technique. 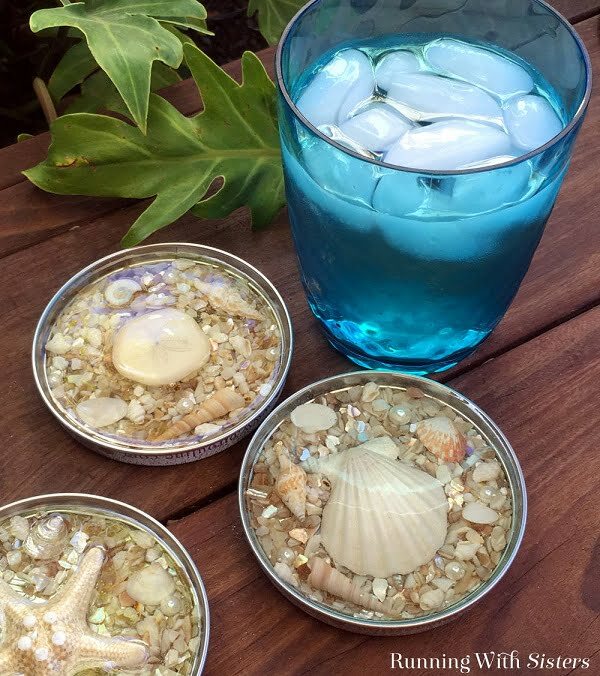 If you have seashells from the latest trip to the beach, now is the time to put them to good use. You’ll definitely have fun doing this project. This is a unique project and perhaps it’s not for everyone. But if you’re a cat person you’ll definitely love it. 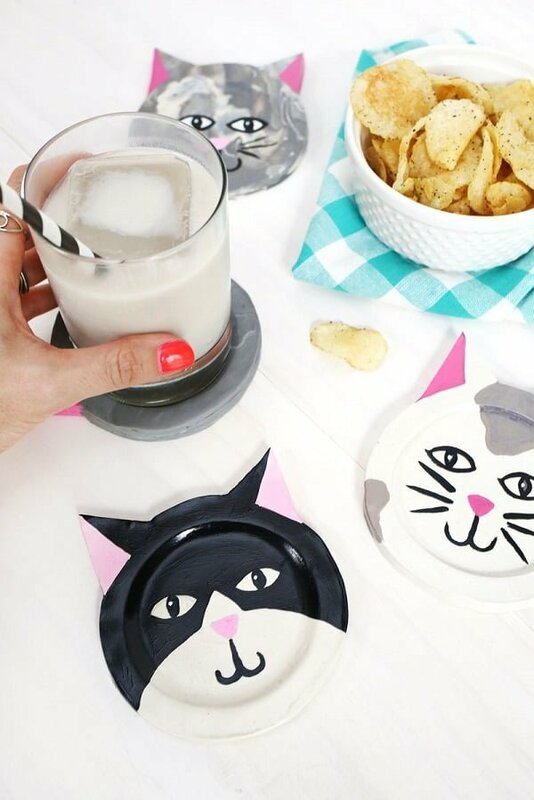 The project uses clay and a cat template to create adorable DIY coasters. The process is very simple. 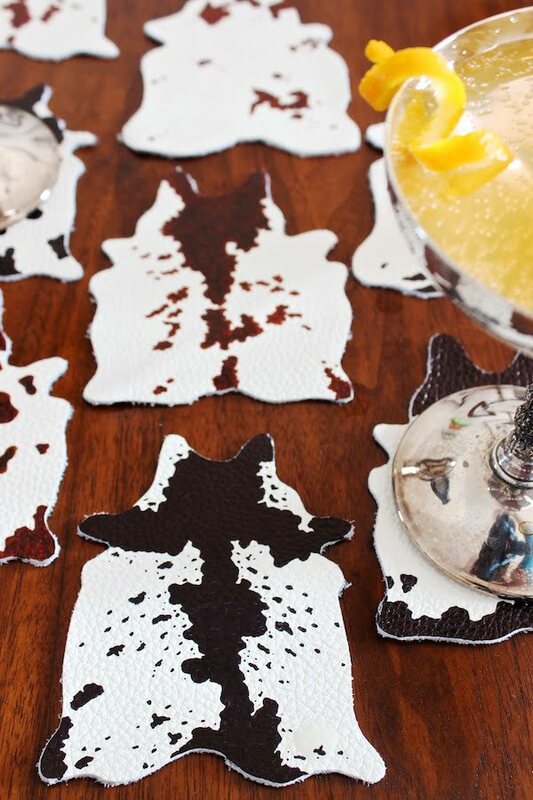 Are you ready to add some kitty coasters to your table decor? 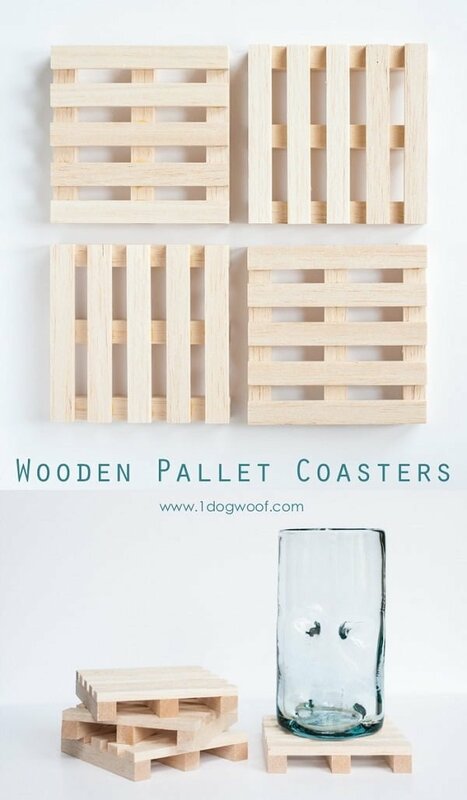 No, you’ll not be making coasters from actual pallet wood. But if you’re a fan of wood crafting you’ll love these mini pallet coasters. They just look so crafty. And they’re so easy to make. All you need is a bunch of dowels and glue to put them together. The resulting coasters are pretty sturdy even for big mugs. So have fun making them and make a bunch! What a great craft project for any scrap leather you may have handy. 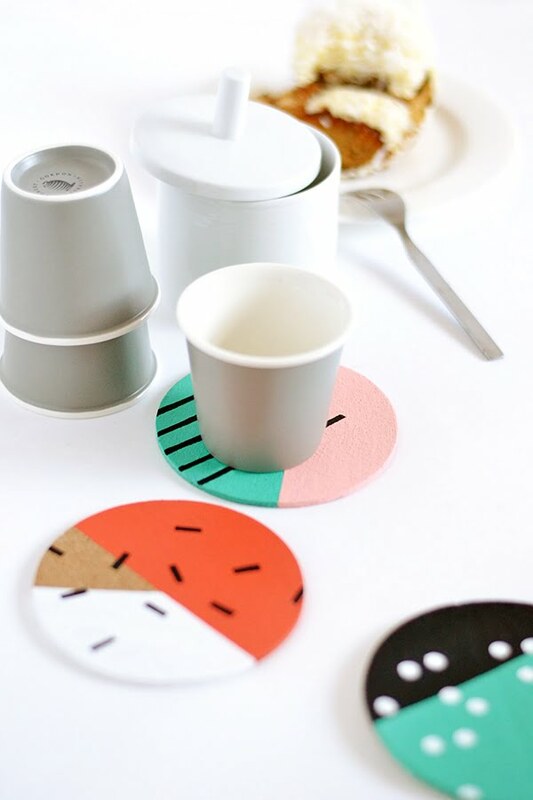 All you have to do to make these DIY coaster is to cut the material in the right shape. That’s it! You have fantastic coasters in rustic style. You won’t be giving them out as gifts but they’ll make pretty nice conversation pieces for your table decor. Lace is classy and if you can make DIY coasters from it then you should definitely do it. The process is simple. You need cork and lace fabric to apply as the cover. Of course, you need the magical mod podge as well to complete the project. It’s really a lot of fun and we have no doubt you’ll be making a lot of these coasters! 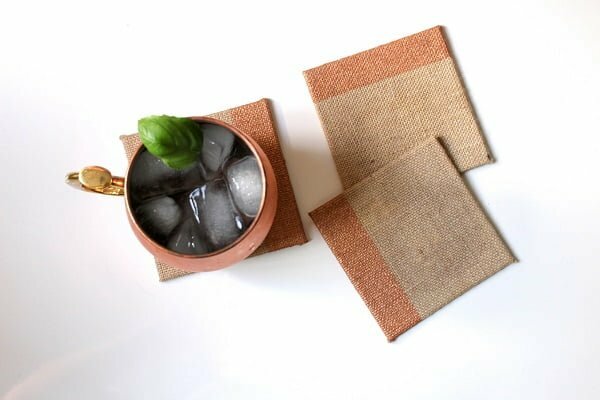 Burlap coasters? Yes, please. There’s no better way to quickly add some rustic statement decor to your tablescapes than burlap. And you can always use more coasters for any occasion. The project is very easy to complete. And you have this wonderful tutorial to follow. Have fun! Looking for a gift idea for a man in your life? How about some beer coasters. These are usually found in bars and you can buy them. But why buy when you can DIY? And you can make them so much better. First of all, you aren’t getting beer coasters of ceramic tiles if you buy them (you can rarely even get cork). And crafting yourself means you can use any kind of material. So get your hands dirty and make some awesome DIY coasters! 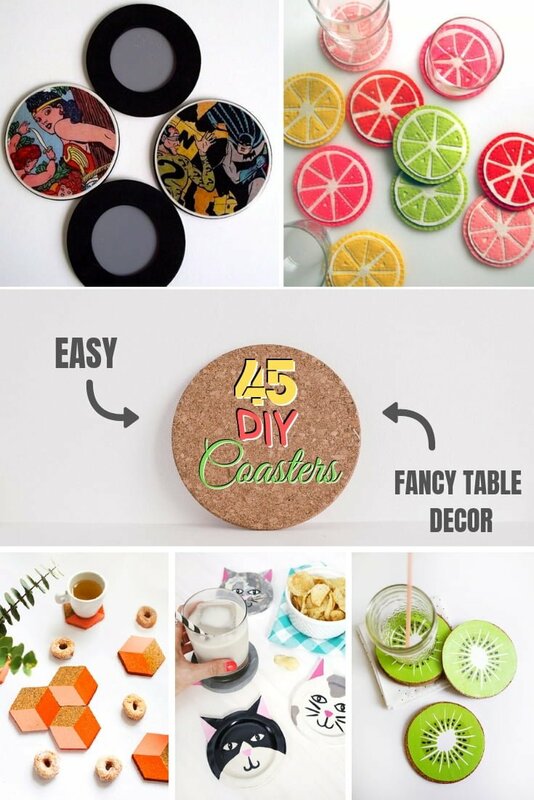 It seems that we’ve covered just about any type of crafting and materials to make DIY coasters on this list. There’s just one thing left and that’s quilting. Yes, you can quilt your own coasters as well. And what beautiful coasters they turn out to be. If you’re a beginner in quilting, this can actually be a great project to practice. Go ahead and give it a try! You can either love marble or hate it. And if you fall under the former category, you’ll love this project as well. Even if you don’t have marble counters in your kitchen you can still add hints of it throughout your decor. 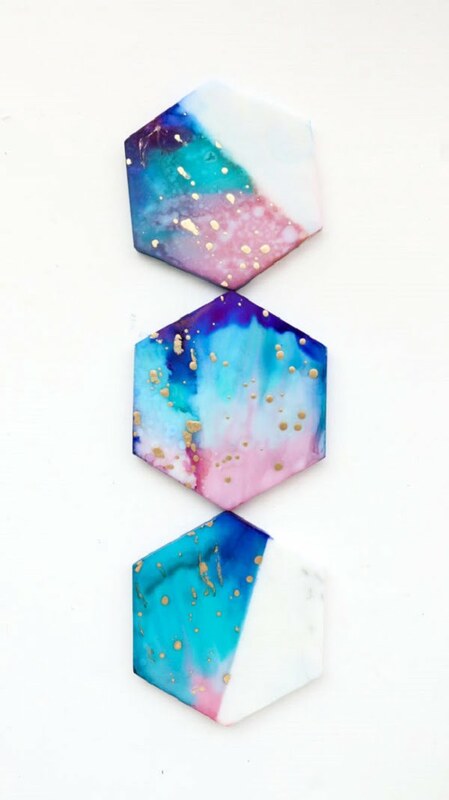 All you have to do is make these faux marble DIY coasters from clay. The technique consists of kneading two colors of clay into the shape. Use the tutorial to get it right. OK, this project is actually for stamped clay magnets, but the very same technique can be used to make pretty cool coasters. So, you need clay and desired design stamps that you can pick up in a crafts store. 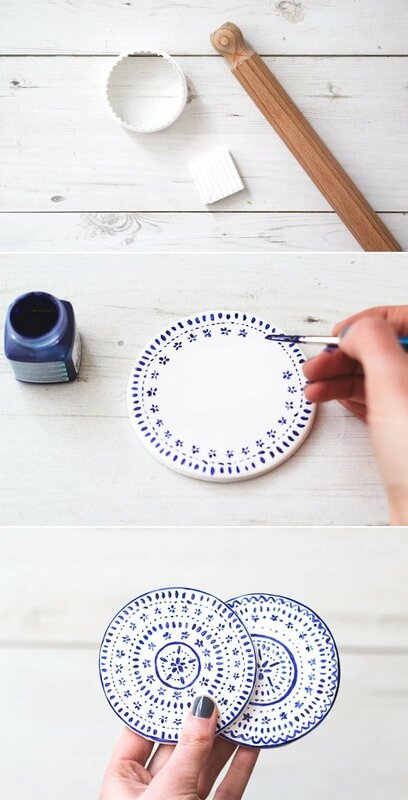 Cut the clay into circles or any other shape and stamp the design. To make better coasters you can use cork for the pad as well (instead of magnets). It’s pretty cool when you can adjust and use tutorials like this creatively, isn’t it? That’s all about DIY! You can’t have better material for crafts as resin. It’s really pretty cool as you can make just about anything from the material. 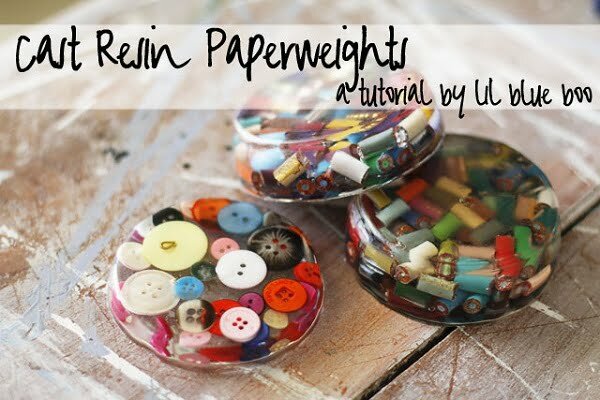 In this case, let’s make some paperweight coasters! They’re like regular coasters just weight more to be able to weight down your documents. You can use just about anything as the filler for these coasters. The more creative you are the more unique coasters you’ll get. It can be buttons, beads, or anything you have handy! To make marble coasters more interesting, you can paint them creatively. The more color the better! You can use these coasters to add a lot of decor interest to your coffee tables. This tutorial will show you how to paint fancy galaxy colors. The process is pretty simple even for beginners. 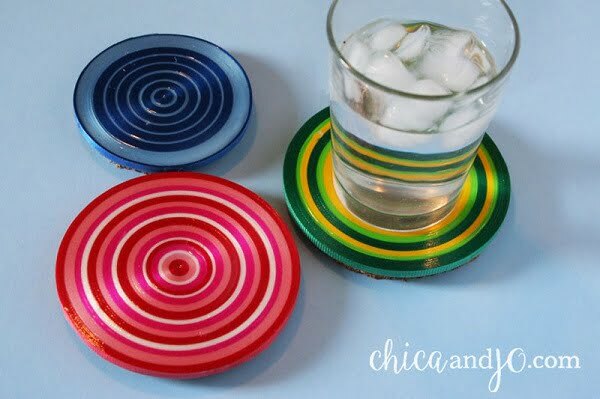 You can make several of these DIY coasters and experiment with different colors and patterns! Themed coasters are a lot of fun. You can always make some of these for all special occasions. In this case, we’re getting ready for the fall season! 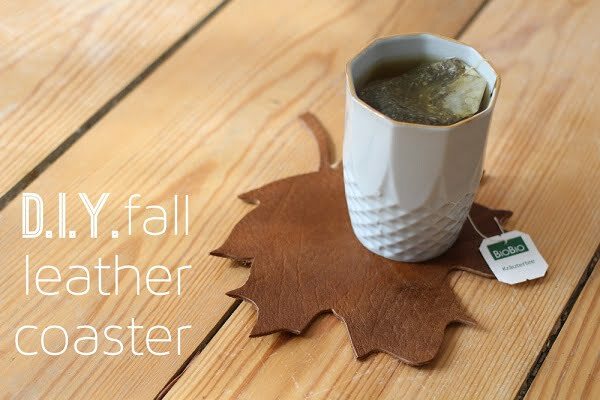 To make these leaf-shaped DIY coasters you just need to cut leather. Printout the design to use as the guide and you’re all set. A maple leaf is an intricate shape that requires precision but you’ll get a hang of it after a few tries. Most importantly, have fun doing it! Have you ever seen some coasters that you just had to have? You can buy a lot of the coaster you see online but sometimes there just aren’t any you like! In that case, you can make pretty much any coasters using this technique. 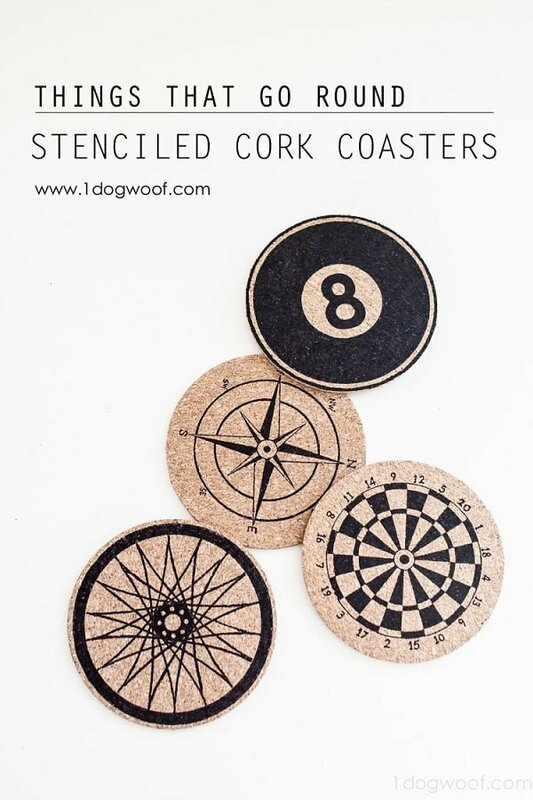 Using stencils is a great way to transform cork coasters. All you have to do is print them out and apply this technique. Check out the tutorial for all the details.